Former Federal Prosecutor David A. Golas and his family will fight for you. We are available 24 hours a day, 365 days a year. Accidents, Divorce, and Criminal Defense. We represent clients throughout Connecticut in Courthouses in Danielson, Enfield, Hartford, Manchester, Middletown, New Britain, New Haven, New London, Norwich, Rockville, Tolland and Willimantic. General Practice Law Firm, Family Law, Divorce, Personal Injury, Criminal Law, Wills & Trusts, Foreclosure Law, Appellate Law, Real Estate, DUI, DWI, Medicaid, Title 19. Founded in 1969, Golas, Golas & Golas, P.C. is a general practice of law with a continued tradition of dedication and service to our clients and community. 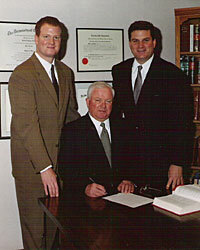 The firms lawyers are founder David A. Golas, Sr. his two sons, David A. Golas II, Jon D. Golas and David Sr’s daughter in law Danielle Maloney Golas. The firm’s real estate and litigation paralegals are Deb Gochee and Olivia J. Golas. Our office is located on 249 East Center Street in Manchester, Connecticut and offers free and accessible parking. We represent clients throughout the State of Connecticut and the State of Massachusetts. Our practice is unique in that we are a family law firm, and although each partner has a special area of concentration, typically each client’s legal needs are handled in a collaborative manner. Therefore, when calling our office, you can speak to any one of the attorneys and be assured that you have four legal minds concerned and working on your case. We recognize the need to be flexible and responsive in today’s competitive legal market. We pride ourselves on personal service, including house calls or travel to the hospital if clients are unable to come to the office for an appointment. Our goal is to provide quality representation at an affordable cost with the hope of building a long lasting relationship for the future. The cases presented in this web site are examples of some of our results. However, every case is different. The descriptions of our previous settlements and jury verdicts are not meant to be a guarantee of success in any case nor are they meant to imply that any particular case has a similar settlement or jury value. Visiting this web site, sending an e-mail, or filing in a “contact us” form do not establish an attorney/client relationship with Golas, Golas & Golas, PC or any of its attorneys. Under the Rules of Practice in Connecticut the only way to establish such a relationship is by entering a written agreement with Golas, Golas & Golas, PC. To return to the previous page, use the back button on your browser.